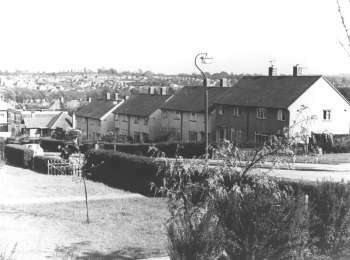 Now linking the local shopping centre in Cotmandene Crescent to the main Sevenoaks Way, the houses in Broomwood Road are well sited and popular. Earlier than the main St. Paul's Cray Estate, they were begun during the 1930s, when the Sevenoaks Way and Orpington by-pass were being laid out, although those pictured here are part of the later main development. The road is named after an ancient wood and follows the line of a track that led from St. Paulinus, the parish church, up onto St. Paul's Cray Common.